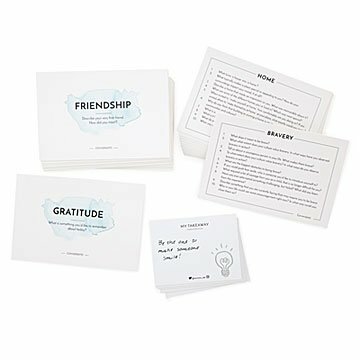 This set of thoughtful prompts encourages entertaining, meaningful discussion. We send texts, comment on social media posts, and make small talk every now and then. But when was the last time you had a deep conversation? Tackling topics beyond, "Some weather, huh?" can be tricky, but this set of thoughtful prompts is a fun way to get a meaningful dialogue flowing. Once you've delved into topics like friendship, bravery, and food (just to name a few), everyone writes down their favorite takeaways from the experience. Whether you're at an actual dinner party, keeping a long road trip lively, or even "team bonding" with coworkers, you're sure to end the game a little closer to your cohorts than when you started. Made in China. 7" L x 4.5" W x 2"